Each of these trays contain seven varieties of our choice from a wide range of foliage starter plants. This selection is designed for those growers needing lots of variety in one flat and are willing to take our choice of plant material. We choose each plant for its ease of growing (with similar growth habits) and spectacular performance. Your customers will enjoy them in everything from landscape applications, to houseplants, to outdoor hanging baskets. 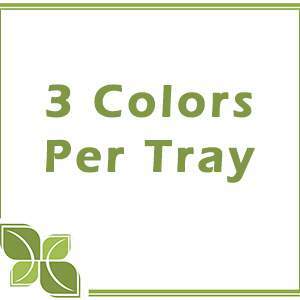 We have designed this tray to plant 21 baskets, if you plant each variety with 5 plants per basket. Each 105 cell liner will ship with seven different varieties of our choice. That's fifteen plants of each type, or 3 baskets of each variety. For best results, use a constant-but-low feed program of 200 ppm N. A pH between 5.5 and 6.5 is important for the healthiest plant color. Depending on which plants you receive, spacing will vary based on variety, plant habit, and container size. Just be sure to allow enough room for air flow and penetration of sunlight. Most of our foliage plants are fairly disease-resistant, but don't oversaturate the soil. If the plants sit in moist soil for an extended amount of time, you could end up with root rot or botrytis. Botrytis grey rot is usually associated with wet or humid conditions. You can prevent botrytis by allowing the plant to dry out between waterings, allowing for good airflow in your greenhouse, and spacing to allow the sun to penetrate to the soil level. The most common chemicals used to treat botrytis and root rot are Medallion and Banrot. Use them as a drench according to each label's instructions. Pinching may be required, depending on the plants you receive. Shape plants as needed.